If there’s one thing that every cat owner knows, our feline friends love to sleep. A normal house cat can sleeps an average of fifteen hours a day according to PetMD. Cats have a biological need to sleep in order to save energy for the hunt, a trait that has been passed on from their wild feline cousins. If your cat is sleeping all day, shouldn’t you give it a comfy spot for a snooze? In this article we’ll take a brief look into the science behind why cats need so much sleep. We’ll also talk about what makes a good cat bed, and finish off with the 10 best cat bed products we have to offer. Cats can sleep anywhere from 12-20 hours a day, making them one of the biggest sleepers in the animal kingdom. The main reason that cats spend the day snoozing is to conserve enough energy for a successful hunt. Let’s take a look at some of the things that compel kitties to sleep all day. Although most household cats are completely domesticated, there are still a few traits that they borrow from their wild cousins. All cats are predators, so they have the desire to hunt after their prey. You can see these instincts during playtime with your cat, as they skulk around to try and sneak up on their prey. In the wild, hunting can take a lot of energy and focus. This is why wild cats, such as lions and cheetahs, will spend most of the day conserving their energy. While household cats have no need to hunt for their food, their biological calendar forces them to follow the same schedule as if they were in the wild. If you’ve ever watched your cat sleep, you may have noticed that it’s not difficult to stir them from their slumber. This is because cats spend most of the day in a light sleep, commonly known as ‘dozing’. Cat dozes, also known as cat naps, typically last anywhere from 15 minutes to a half an hour. During these light cycles of sleep, cats will position themselves so they can spring to action at any moment. This allows them to keep aware should they need to suddenly chase after a prey. There are a few tell tale signs that indicate your cat is dozing. You may notice your cat’s ears twitching or swiveling back and forth, or moving towards a sound. You might also notice their eyes occasionally opening to survey the scene before closing again. Cats can experience periods of deep sleep, which only last about five minutes. Cats will experience rapid brain movement during these deep sleep periods. After the period of deep sleep is over, cats will go back to dozing. Anyone who has had cats know that dusk is a prime time for kitty activity. Cats are crepuscular, meaning they are most active during the twilight hours. During this time, cats are up and on the prowl for prey. Although they are hardwired to sleep during the day, many household cats adjust their sleep schedule to spend more time with their owners. This may be why you find your cat more active during prime dozing hours. Cats are well tuned to their environment, and can be affected by the weather even if they stay predominantly indoors. You may find that your cat sleeps more during a rainy day, when there is likely nothing that it can hunt. A cat’s desire to sleep during stormy weather is likely due to their biological disposition warning them that there will be no prey to hunt. Rather than waste all their energy on a fruitless hunt, cats take the opportunity to charge up for a more opportune moment. Now that you understand the importance of a good cat nap, it’s time to invest in a nice bed for your furry friend to rest on. You may be wondering: are all cat beds the same? While it seems like a cat can fall asleep anywhere, there are a few things that will make a cat bed the perfect place for a snooze. Comfortable Materials. 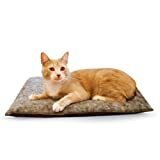 Since your cat will likely be sleeping for most of the day, you’ll want a cat bed that has comfortable materials. You’ll want a bed with a plush filling and soft sleeping surface. Privacy. Some cats have a hard time dozing off if they’re in the middle of a high traffic area. Many cat beds offer coverings that give your cat the privacy they need for a good snooze. Easy to Clean. We all know how much cats can shed, especially when they’re in one spot for long periods of time. A good cat bed is easy to clean, and many can be thrown right into the washing machine. Heating Pad. While a heating pad is not necessary for a cat to fall asleep, it can be a comforting touch. Many of the beds we offer have heating elements that will keep your cats warm without putting them in danger. Anti-Slip Bottom. Cats will likely be stepping in and out of their beds throughout the day, which can cause the bed to shift around. A good cat bed will have an anti-slip bottom to keep the bed in the right position. Activities and Toys. Just because a cat wants to sleep all day doesn’t mean it should. Many modern cat beds feature toys or climbing activities that aim to help your cat expel that pent up energy. At Pro Pet Supplies, we offer a variety of different cat beds that will fit all of your cat’s snoozing needs. Here are ten of the best cat beds we have to offer. 100% SATISFACTION GUARANTEE: FEANDREA provides professional customer service before and after your purchase; don't wait any longer and enjoy it now! We start this list off with one of the larger cat beds we have to offer, the Catville Bungalow. This bed has a total of four hideaway spots, making it perfect for a multi-cat house. There is a ‘penthouse’ nook, two covered dens, and a covered area on the lowest level. 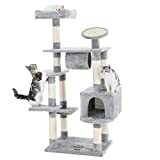 This bed also features multiple amenities for your cats to enjoy, including two full scratching posts and puffball toys. 2-in-1: Durable zipper keeps tent from caving. Easily unzips into a flat mat for use as a warm blanket or as the base of your pet's bed, for extra warmth and cushion. Thermo-Reflective core reflects your pets body heat, while the soft faux Sherpa liner wraps your pet in comfort. Together they create a cozy and warm environment for your pet. Traps hair like a magnet, making it great for protecting your surfaces from pet hair, and other stains sometimes caused by pets. Can be used on the floor, couch, bed, cat perches, in the car etc. Tunnel's core is made of soft materials to ensure maximum comfort. Because of this, tunnel may sink at the top when zipped up. Please note that tunnel is not a house, and the sinking at the top is normal and will provide more comfort for your pet. ​This comfortable bed gives your cat a cozy spot to lounge throughout the day. The Attract-O-Mat Tunnel Sleeve is a great option for smaller spaces, and it can easily fit in any home. 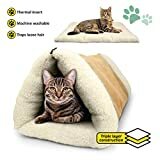 Cats love the plush bedding and hide away tunnel. The electrostatic polyester material captures pet hair and dander, so you won’t have to worry about flyaway hairs. This bed is easy to clean and can be tossed directly into the washing machine. ​Many pet owners realize the value of a warming bed for their cat, but worry about the potential fire hazards a heating pad brings. To combat this, Aspen Pets created a self-warming cat bed that requires no electricity. These beds are lined with material that traps warmth from your cat’s body, only to release it when the temperature drops. The surface of this bed is made with a soft wool material that is great for a midday cat snooze. The overstuffed bolsters add support for the cat’s neck, and keeps the cat feeling secure in the bed. There is also a non-skid bottom that helps keep the bed in place, even on tile or hardwood. ​If your cat has a tendency to hide in boxes, the MidWest Curious Cat Cube by Feline Nuvo might be the perfect place for your frisky feline. 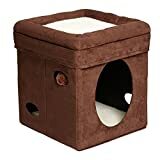 This cat box features a large hide away space for your cat to lounge in privacy. It has multiple hanging toys and “hide and seek” cut outs that can be used to promote playtime. The Cat Cube is easy to assemble, and can be quickly collapsed for storage or travel. The inner sleep area is comprised of a soft synthetic sheepskin, which helps keep in heat. The faux suede exterior looks sleek, and can be easily paired with any type of décor. K&H QUALITY: The K&H Outdoor Kitty House is the original Outdoor Kitty House, don't be fooled by low quality imitations! K&H invented this product for ease of assembly and comfort for outdoor cats. PATENTED & PROVEN: The featured 20 watt MET Safety Listed & Patented Lectro-Soft Heated Bed inside the K&H Outdoor Heated Kitty House keeps your kitties warm, even in sub-zero temperatures. INSULATED AND WEATHER RESISTANT: The exterior surface is constructed of 600-denier Polyester, making this product water/weather resistant. SAFETY LISTED: This product has been tested & certified by MET Labs to exceed USA/CA electrical safety standards. Don't be deceived by electrical products that have not been tested and certified. ​The K&H Heated Outdoor Kitty house is a great option for those who have outdoor kitties that like to roam around at night. This cat bed is made with nylon and vinyl to keep your cat safe and dry. The heating pad comes with a large 5-foot cord that can be plugged into any outlet. There are two exits on this model, so cats can easily escape from dangers such as outdoor predators. ​This heated cat bed uses only 4 watts of electricity, so you don’t have to worry about it overheating. The dual-thermostat unit raises the temperature just 15 degrees above air temperature, creating the perfect environment for a quick doze. You can also remove the heater during the warmer months, or when you want to throw the bed through the wash. 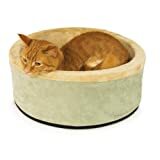 The Thermo-Kitty Heated Cat Bed has one-piece pillow is stuffed with a polyfill material and covered with a smooth fleece. This deep bed creates a cozy corner for your cat to rest in with 6” high foam walls. K&H Pet Products Amazin' Kitty Pad Gray 2 Pack 20" x 15" Traps Cat Hair and Dander! Traps kitty dander and hair like a magnet! ​The K&H Amazin’ Kitty Pad is a simple, inexpensive solution to your cat’s needs. Although it looks thin, this cat bed is filled with a comfortable and lightweight polyester material that will cradle your cat to sleep. The thick polyester fibers grab any stray hair or dander, and can be machine washed. You can easily place this bed on top of couches or mattresses to invite your kitty to rest with you. During the colder months, you can easily slip in a heating pad to help keep your kitties warm. The featured 40 watt MET Safety Listed heated bed inside keeps your kitties warm, even in sub-zero temperatures. 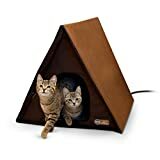 ​This product is an upgrade from the Heated Outdoor Kitty House, with more than enough room for multiple cats. The attractive A-Frame design helps keep water from entering the rest area, so it can be set up just about anywhere. This large cat bed has enough room for up to four cats at a time. The heating pad can be used to help outdoor kitties warm during the cold months, and uses only 40 watts. ​The WARE DOG/CAT Kitty Condo with Perch has a tried and true design that cats love. It is covered with a simple carpet, which kitties can use to doze or sharpen their claws. There are multiple levels to lounge on, including a comfortable enclosed ‘condo’ for extra privacy. This is a high quality, inexpensive product for those who have multiple cats. ​The cute and quirky design of the Prevue Pet Catville Condo is sure to be a hit with human and feline alike. There are two main dozing areas, one an enclosed hideaway and the other a super-soft plush mat. This bed also features a dangling puff ball toy and scratching post to facilitate active playing. The Prevue Pet Products Catville Condo is sturdy, easy to assemble, and looks great in any room. Choosing the right cat bed depends on your specific situation, and there is no right or wrong way to choose. Take some time to observe your cats sleeping behaviors to get a better idea of what kind of cat bed is best. We recommend placing a cat bed in a quiet, sunny spot for your cat to enjoy. This will give them the peace and comfort they need to get a full day’s worth of dozing.